“The United States will no longer be silent as Israel is unfairly attacked at the United Nations. Silence is not my thing anyway, but that’s especially true when it comes to standing up for America’s friends. And we have no better friend in the Middle East than Israel,” Haley said. “The anti-Israel bias that has existed for so long at the UN is cut from the same cloth as the BDS movement and the global rise in anti-Semitism. They all seek to delegitimize Israel. They are all efforts to intimidate her friends and embolden her enemies. “As long as I’m America’s representative at the UN, I am going to stand for human rights and I am going to stand for the truth. And that means I am going to stand for Israel,” the ambassador added. 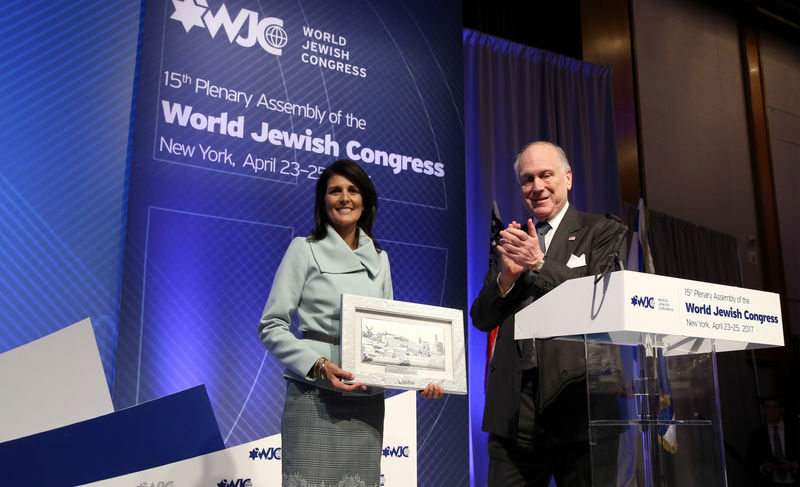 Haley declared that the UN must cease its hypocrisy in singling out Israel, and recognize that the true source of instability in the Middle East is Iran. “As with the issue of human rights and Israel, it is the simple truth that will guide the United States policy toward Iran – both inside the UN and out. The truth is that Iran is the world’s number one state sponsor of terrorism. The truth is that Iran is the number one source of instability in the Middle East. Thank you s o much for that very nice welcome. I want to welcome all of you to New York from all across the world. To have over 90 countries represented here is amazing. Your presence here is a huge testament to your dedication to a cause that we all know is so important. I want all of you to know that you could not have a better leader as your president than Ambassador Ronald Lauder. I have met with Ambassador Lauder in my office at the UN, and I’ve found his counsel very wise and very helpful. I can assure you that his viewpoints are widely respected at the highest levels of the American government, as well as around the world. It’s always a special treat for me to be in the company of the Jewish community. One of the reasons why is that Jewish and Indian communities are really very similar. Both of us are very close knit, very family oriented. We have strong work ethics. We highly value education for our children. On a side note, we’re also both stubborn, and neither of us back down from a fight. I’m particularly happy to speak today following Secretary General Guterres’s appearance here on Sunday – the first for a UN secretary general at a World Jewish Congress conference. Secretary General Guterres is a good partner. He is committed to fighting anti-Semitism and bigotry in all its forms. We are fortunate to have him at the UN. It’s still early in my time as ambassador, but I think I can safely say that it’s a new day for Israel at the United Nations. I know it’s a new day for Israel at the US Mission to the United Nations. Before I was confirmed as ambassador, I watched in horror as the Security Council passed resolution 2334 – and the US stood by and allowed it to happen. I can say with complete and total confidence that those days are over. The United States will no longer be silent as Israel is unfairly attacked at the United Nations. Silence is not my thing anyway, but that’s especially true when it comes to standing up for America’s friends. And we have no better friend in the Middle East than Israel. The anti-Israel bias that has existed for so long at the UN is cut from the same cloth as the BDS movement and the global rise in anti-Semitism. Everyone pays lip service to these words, of course. Everyone claims to support human rights. But when it comes time to singling out a country for violating these rights - the amount of hypocrisy is just unbelievable. Israel is singled out more than Iran, Syria, and North Korea. It’s just shocking, and it undermines the entire credibility of the UN. However, pushing back against the bias is easier than many people think. There’s really no magic to it. All you have to do is tell the truth. The truth is there is only one true democracy in the Middle East. There is only one country in the region that grants equal justice under the law. There is only one country that fully respects the rights of women and religious minorities. As long as I’m America’s representative at the UN, I am going to stand for human rights and I am going to stand for the truth. And that means I am going to stand for Israel. I felt the same way when I was governor of South Carolina. I’m proud that my home state led the nation in taking on the BDS movement. We passed a law in 2015 that unapologetically upholds the values that Israel and the United States share. We were the first in the nation to do that. We said we will not use taxpayer funds to do business with any company that discriminates on the basis of race, color, religion, gender, or national origin. And make no mistake, that is exactly what the BDS movement does. Getting rid of Israel-bias at the UN is closely connected to getting rid of the Israel obsession at the UN. Every month the Security Council convenes a meeting on the Middle East. And every month this meeting turns into an Israel-bashing session. The Middle East is a region that is home to a disproportionate number of the conflicts in the world, and those conflicts have nothing to do with Israel. That is not where our focus should be. The United States is the president of the UN Security Council this month, so I get to chair the Security Council meetings. Well, last week I decided that if I was going to be chairing this meeting on the Middle East, I was not going to be part of the same old tired talking points. I told my colleagues that if we were going to speak honestly about conflict in the Middle East, we had to start with who is most responsible for that conflict. The responsible party is Iran. Iran and its terrorist militia partner Hizballah conspire together to destabilize the Middle East. In Lebanon, Hezbollah uses civilian men, women, and children to shield its illegal arsenals of rockets. In Syria, Hezbollah – under Iran’s instruction – fights side-by-side with Assad as they slaughter the Syrian people. Iran is the threat that should be taking up the time of the Security Council. Hezbollah is the destabilizing force that should be the focus of our monthly meetings. Together, Iran and Hezbollah are the source of human rights violations and security threats. That should be the “obsession” of the United Nations. That was my message to the Security Council last week. I hope they take it to heart. But the United States is not waiting to focus its attention and its power on the real source of instability in the Middle East. As with the issue of human rights and Israel, it is the simple truth that will guide the United States policy toward Iran – both inside the UN and out. The truth is that Iran is the world’s number one state sponsor of terrorism. The truth is that Iran is the number one source of instability in the Middle East. The facts are this: Israel has the right to exist in peace and security. Israel is America’s best friend in the Middle East. Israel and America both seek peace. Anti-Semitism must be ended in all of its forms in every place on the planet. My job is simply to stand for the truth. I am grateful to the World Jewish Congress for being a partner in this noble cause.